One last card to wrap up the week - this is a really large butterfly, and I've been wanting to do one for a while. The wings are 4-3/4" across at the widest point - it's huge, and just gorgeous. Again, I used my MISTI for this technique - that tool has changed the way I stamp, for sure! (And did you know 2 new sizes will be revealed this weekend at the CHA Megashow?) This technique is done with Brusho powders, which usually frightens people whose MISTIs are new... but mine is well loved, worn, and stained, so I feel free to get a little messy in it. :) The stamp is misted with water, then stamped into dry powder on the card... then that's repeated until the powder is all activated. It's not a really clear image, but that adds to the effect. A tutorial is probably in order soon! For the second card I created a background using Brusho powders on photo paper - I love how vibrant the colors stay! I added a background stamp for texture, and a sweet charm on some wrapped twine. Beautiful card. Yes please do a tutorial on the technique. The techniques are crazy cool and the result is fabulous. Beautiful cards!! !I think I will get me a MISTI! !Ilove to stamp and color,after seening all this beautiful work ,I really need one!This was a great hop,awesome stamps!! I adore your cards. Have never used a misti, although friends have it and I've seen it in action. Also have never used those Brusho powders, but after seeing what you've done, I will have to look into them. Can't get enough butterflies and the background is a Wow. Love Love Love the butterflies and I need to try those brushos! Yes, please do a tutorial... I have some Brushos and want to try them... Hope they come out as gorgeous as your have!! I love the products IO are great. Thanks for the nice party. Very beautiful card. Beautiful cards! The large butterfly stamp is a must have! What a glorious card! It makes my heart sing! Gorgeous cards! I love that big butterfly you used on the first card! Lovely effects with the Brusho powder! My wonderful hubby surprised me with a MISTI for Christmas... I was in shock. Who knew he was paying attention when I had told him about it! LOL! Thank you for sharing so many techniques to use with my new toy!! I'm loving all of the new butterflies I'm seeing in the new IO release. I never seem to be able to stop buying butterfly stamps and/or dies. Beautiful cards. Love the grunge butterfly. Besides the new butterflies being on my shopping list - so is Brusho!!! I definitely have to try some Brusho! What an absolutely gorgeous butterfly, I love it. Both cards are very beautiful!! I love the butterflies!! Love these cards, so artistic! I do love butterfly stamps also. Love the sentiment on the first card and the beautiful background and silhouette on the second. Well done. You are sooooo talented, Dina! Love both of these. The second card is my favorite...guess because the colors really POP! Thanks for sharing! The cards are so beautifully made. I enjoy learning new techniques - very nice effect - I'm looking forward to the tutorial. Beautiful bold colors on your cards. Very nice cards. Thanks for explaining about "MISTI". I had no idea. I am interested in trying this technique and would be very grateful for a tutorial. Your cards are so beautiful Dina. Such a true artists you are. Great results using the Brusho powders and the butterfly stamps. The technique with the Brusho powders sounds intriguing and you get great results. I just don't know if I am brave enough to try it. Your work is always a joy to behold! And, you are correct...I would LOVE to see a VIDEO tutorial of your work with the MISTI and Brusho! How do you apply the powder to the stamp ON the Misti? How do you clean it to prevent "contaminating" future projects? (And, yes, my beloved Misti is well used and well loved but "clean"!) When I use any of the brands of powders, I spend a week finding little color smudges :) on any project I do on that same work area!...and I am really not that messy! :) HELP! any Tips would be much appreciated! I love your really large butterfly!! Cool card using the brushos with this stamp! I have not heard of Brusho powders before. It would be great to see a tutorial and thanks for describing the technique to us. These Brusho stamped cards are amazing, Dina! Thanks, Paulette S.
Your choice of colors, butterflies, and technique is amazing. Yummy! OMG!!! These are stunning!! !I love the huge butterfly! Really love the large butterfly, one of my favorites this release! Thanks for sharing. I am really loving all the sentiments! Stunning! I love your cards and presentations. Thank you so much for sharing, I am really looking forward to following you through the year... God bless you. I'm a huge fan of both big- and collaged images, so the big butterfly is right up my alley and a definite "must have". Love how you've used it! Oh I must see a tutorial you do with Brushos and the butterfly! Thanks! Love what you've done with that butterfly! GORGEOUS! Wow, I love both cards! 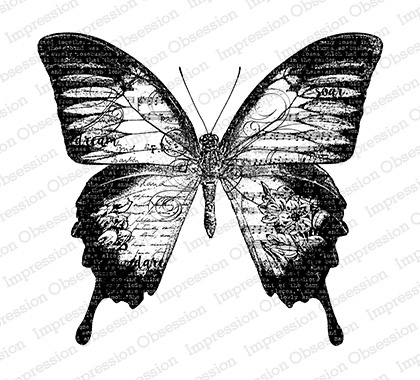 The large butterfly is so beautiful the way you stamped it!